I did a search and found nothing on the pearce grip pinky extension so I thought I would post it. I just got mine today and I like it. I have large hands so the I wanted to try a pinky extension. It is not long like the extended mag. No extra rounds but my pinky now fits perfectly on the grip. Just thought I'd share. Thanks for sharing. Thought about ordering a few of those along with some XDS magazines. Now only if I could find the magazines. I only ordered one because I wasn't sure I would like it. I will definitely order a couple more, along with an extended mag and another 5 rounder when they come back in stock. The Ft Lewis PX and McChord AFB BX had plenty the last time I was there. I picked up an extra 7-round mag for $37. Pricey but no tax or shipping. I also have one and really like how it feels now. Need to get another. I've never been a huge fan of these extensions on other guns. However with the XDS I require the extra purchase on the grip which this provides. 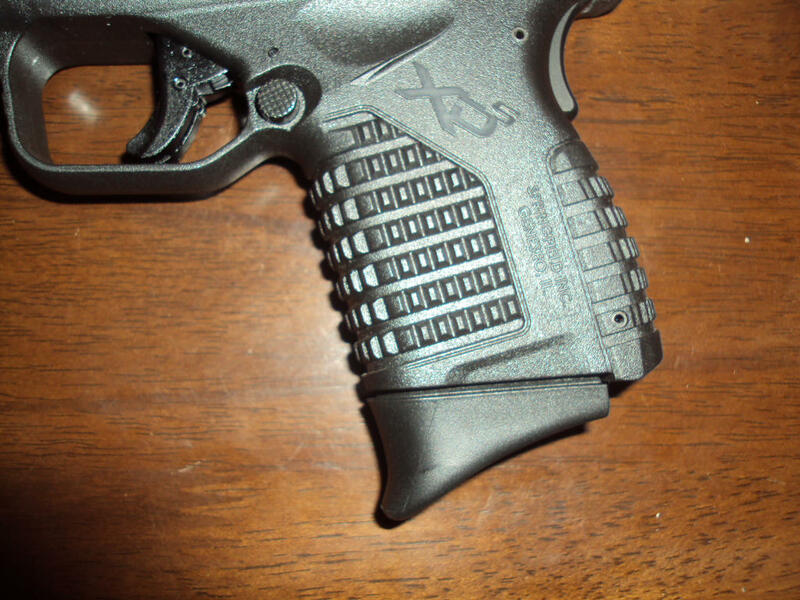 I just got some today for my XDS mags & they really take care of the "dangling pinky" problem. I've been using the extensions for the past few trips to the range. It's made a considerable difference in my timing and control of follow-up shots. All a matter of a more confident grip. You guys are not kidding about these extensions. I went to qualify with the XDS this past Monday. Shot a few target rounds (Winchester 230gr white box) first. Qualifying rounds were Hornady 220+P's Critical Duty. Just saying what a difference there was between the ammo with muzzle flip which was to be expected. Ordered 3 extensions the next day. I just tried to order two of them from Sportsman's, but they wanted $13 for shipping. They must be smoking crack or they think I am. Ordered mine from Pearce, $6 to ship them. I also like mine. I really like the Pearce grips. Been using them for a long time. Used them on my XD Sub-compact and they really make holding the pistol so much easier. That's the Pearce extention superimposed over the factory grip extention. Same as the OP. The Pearce isn't textured. Thanks guys. Just went to the Pearce grip site and picked up 2 for $25 shipped.